I remember as a kid, making model airplanes out of balsa wood kits. I wasn’t very good at it, as my low level of patience always had me cutting corners, inevitably causing structural defects (along with a few slices of my fingers with the exacto knife). Hobbyists of the very near future are going to have a much easier time at making model planes, as 3D printer maker Objet’s materials engineer Shai Hirsh demonstrates. Instead of measuring, cutting and glueing the balsa wood manually, he has designed and 3D printed his model airplane’s lightweight and strong structure–a structure that won’t break apart as easily as a balsa airplane on those unanticipated hard landings. Hirsch, in his spare time at Objet, has created a good-sized, remote control airplane using the Object Connex500 3D printer. The printed parts include the front and back fuselage, central wings and wing tips, horizontal stabilizer/elevator, and the canopy. The open truss structure design is the same found in full-size airplanes made out of steel or aluminum tubing, welded together into triangular shapes called trusses. Of course, with 3D printing, there is no welding (analogous to no glueing in model airplanes) — they are printed as complete parts. An interesting note, something that blows away people new to 3D printing, is that the moving parts–in this case, the hinged aileron, elevator and rudder assemblies–are 3D printed in one go. 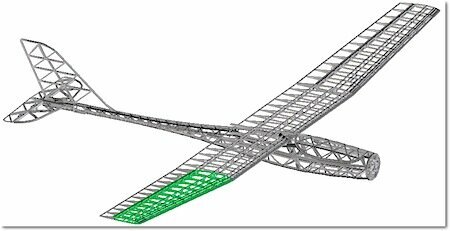 The entire finished 120cm wingspan airplane weighs only 405 grams, without the 1000mAh battery. It’s powered by a 30gr 1400KV motor spinning a 8×3.8 propeller. And, think about this: if Hirsch decides to modify the design for different aerodynamic characteristics, all he has to do is go to his 3D modeling program, make a few changes, and reprint a particular section and reassemble. This would be tough with a balsa model. This model airplane has ramifications for both the model airplane enthusiast and the airplane industry. How long until all model airplanes are created this way? While not everyone can have an expensive commercial 3D printer at his disposal, everyone does have access to 3D printing services that can print and deliver any uploaded 3D files. As for the airplane industry, we’re going to have to build some pretty big 3D printers first — but there’s nothing stopping this except cost, and maybe some soon-to-be unhappy unions. Here’s Shai’s on building 3D printed airplanes: “I always liked planes and flew remote control planes for a short while as a kid, but the engineering was a little bit too complex for me back then. Then a few years ago electric propulsion for remote control planes started really growing and so I got back into flying. As with seemingly every industry, 3D printing is making us rethink how we make things.